Synopsis from Linucon program book: Wanting to build a costume? Grab a seat for some tips and tricks from those who know. My impression. 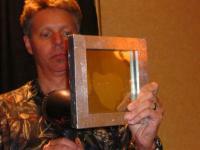 There are several ways you can win a costume award at a masquerade. By making audience laugh, for example. By being original. There is also a fairly self-explanatory "workmanship" category. This panel devoted quite a bit of space to the tips and tricks of how to make a costume, and they managed to be quite entertaining while doing that. Far from being tedious, their discussion was enlivened with all kinds of titillating details from the costume history. The panelists also spoke about the psychology of wearing a costume, and the motivation for making one in the first place. All in all, an interesting panel even for those who, like myself, have only a marginal interest in costuming. Pictures from Linucon 2004 can be found in my photo gallery. Read more about The Tron Guy in my blog. Panelists discuss the process of self-editing. And no, we don't mean just chucking it out the window and starting over. How can you honestly and dispassionately proof and edit your writing? Start with the ending and write toward the beginning; kill your darlings; summarize a scene in one sentence. Finally, funny tales from editors' trenches. 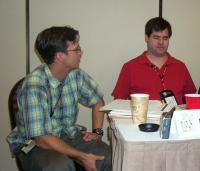 Pictures from ApolloCon 2007 are in my photo gallery. 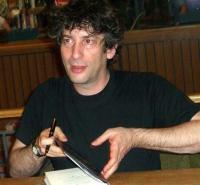 On September 25, 2005, Book People, an independent bookstore in Austin, TX, hosted a meeting with Neil Gaiman, a phenomenally popular author. Gaiman read an excerpt from his new novel "Anansi Boys", answered questions and signed books. More pictures from this event can be found in this photo album. Q1. How do you your historical research? Q2. Can you comment briefly on your perception of status of science and philosophy in the current education system? Q3. 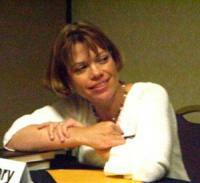 Do you have any plans to write more nonfiction? Q4. What are you reading now? Q5. The future of metaweb, and is it a good forum to explore how can we get Enlightenment to start again? Q6. Now that you've been through this process, do you see yourself engaging in the long, long form again? Q7. You spend that much time just setting the stage for the final conflict. Your prose, your writing style alone is what keeps people coming back. Is that daunting to your publisher? Q8. When you were here last October, you talked about how you explored history for Cryptonomicon, and the Baroque Cycle. Do you think you reached the end of that? Q10. Can you talk about Waterhouse and Shaftoe characters, why they appeal to you and why they showed up in the last 4 books? Q11. I was just wondering if < some author of historical fiction and/or his book> caught your eye while you were writing this. Q12. Did you develop a lot of material for "Cryptonomicon" and the Baroque Cycle that's not included in the final versions? Q13. What are your favorite books of all time? Q14. Are you still a speed metal fan? Q15. On Neal Stephenson's view of history and how it informs his understanding of current events; and how come current political realities don't play a significant part in his fiction? On September 25, 2008 Neal Stephenson gave a reading from his latest novel Anathem, signed books and answered audience's questions. 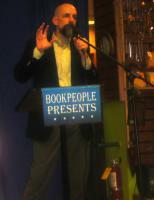 This is Stephenson's third reading and Q/A at Book People over the last 4 years. Some of the questions haven't changed much from year to year. Are his projects getting bigger and bigger? Is he ever going to write something short? Which is the favorite of the novels he has written? Why does he prefer to do his research in books, as opposed to search engines? Hint: serendipity. Are there new technologies he is excited about? Other questions are new. Does he have any ideas on posthumanism? Has he been making something cool in the workshop lately? Why is Anathem set on an imaginary world, not Earth? Panelists at this event are supposed to come up with mundane and science-fictional uses for objects supplied by the audience. They can also use objects they brought themselves. This year's team is C. J. Mills, Steve Wilson, and Chris Roberson. 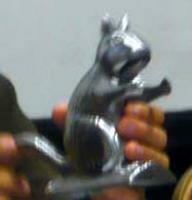 You may never look the same way again at a neti pot, metallic squirrel, or a USB hub. 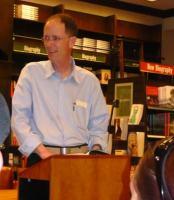 William Gibson gave a reading, answered audience's questions and signed books in Barnes & Noble on June 11, 2008. He started by saying he was glad to be back in Austin, a city that 14 years ago was ground zero for the "so-called" cyberpunk movement. Then the microphone failed. The irony of this happening right before the speech of a writer who pioneered a new attitude towards technology in science fiction did not escape the audience. After a few attempts by B&N staff to fix the microphone, Gibson gave up and said he'll do a reading a capella. "I don't let technology get in my way," he said. "People have been reading books aloud for centuries. I'm gonna do it the way Byron did it, the way Dylan Thomas did it, except sober." And he read part of the first chapter of his latest novel, "Spook Country". Then Gibson answered audience's questions. A few of those questions were specifically about "Spook Country", and they didn't make much sense without having read the novel. Others were about writing and Gibson's view of the world in general. Here are a few questions and Gibson's answers. Does he consider his works to be dystopian? Does he create his characters deliberately, or do they spontaneously generate themselves? The latter is definitely the case, as in an example of a character that grew out of a white room. Is there really such a cultural phenomenon as cyberpunk? Last, not knowing much about technology can enable a SF writer to see the forest for the trees. Pictures available in my photo gallery. 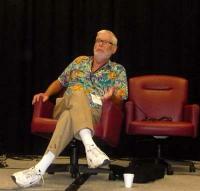 Synopsis from ArmadilloCon program book: Why have the cyberpunks abandoned the future? Do William Gibson's "Pattern Recognition" and Bruce Sterling's "The Zenith Angle" evidence a trend? (And don't forget the pre-2001 "Cryptonomicon" of Neal Stephenson and "Zeitgeist" of Sterling) Are they science fiction? What makes them different from more mainstream techno-thrillers? What does it mean for the future of SF?